Browsing the web a few days ago I came across a couple of television reviews that compared the quality of the new USA network serial show Mr. Robot to Vince Gilligan’s already iconic Breaking Bad. Upon embarking on a deeper web search, I found that Mr. Robot has a very impressive 9.1/10 on IMDB (compared to Breaking Bad’s 9.5/10), a 98% critical and 95% audience score in Rotten Tomatoes (against a 95% and 98% for Gilligan’s show) and a 75 in Metacritic for season one (compared to Breaking Bad’s 73 for its premiere season). Though it seems clear nowadays that we live in an exciting golden era of television, it appears that Mr. Robot has aimed a little higher, already garnering the degree of prestige in some circles that can push a show forward beyond the threat of cancellation whether or not the ratings are there to match. If I learned anything from my experience with Bryan Craston and Aaron Paul’s five season long tour-de-force is that it would have been slightly more enjoyable to follow the show when everyone else had, not after it was over, if only for the social implications of being able to share the excitement. Below my review of the first episode. To say that Mr. Robot starts out with a bang would be an understatement. The first scene not only introduces us to our main character: Elliot Alderson, but it delivers a tense and electrifying exchange between him and a successful business owner named Ron whose life is about to be destroyed suddenly and without reprieve. It is an awesome bit of script and a solid piece of acting that hooks us in without fuss or distraction. As expected, much of the first episode does what it is supposed to do. It follows Elliot at work as part of a high-tech security company charged with protecting the network of vast corporate organizations. We also learn a little about Elliot’s childhood baggage, if only in snippets, and we are introduced to the few, yet very important people in his life. However, it is not until the last few minutes of the first episode where we learn his drive and purpose in life (or what he thinks it is) even if it is trapped by a veil of social anxiety, lack of self-esteem and deep-seethed personal hatred. To say that Elliot participates in the events that he gets involved in might be a bit of a stretch. Instead, Elliot seems to be moving with the flow, reacting rather than anticipating, and following instead of leading. When he takes action it is because he has a natural devotion to those he cares for that borders on a fatherly obsession to protect that may stem from the aforementioned childhood baggage he seems to be carrying. 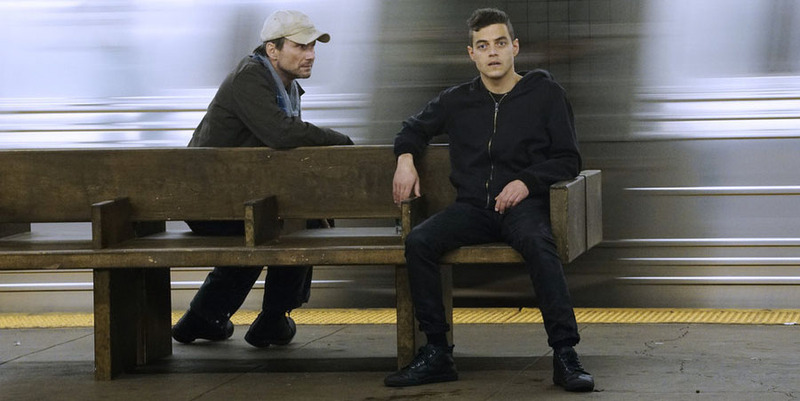 Because of his social anxiety and mental instability, the show teases with the possibility that Elliot is suffering from schizophrenia and paranoia and that maybe, just maybe, he may imagining most of what is happening to him outside of his daily routine. How the show handles such a common plot device will perhaps be one of the trickiest tasks from which to measure the success of season one. Meanwhile, Rami Malek is a truly excellent choice for the main role. He conveys so much through his eyes that seem to want to jump out of their sockets whenever he is in distress or discomfort, which is often. His conversations with himself (or the audience) are exceptional in that they give us insight into a mind that is both genial and troubled. What makes him so intriguing is that what he thinks is not as wild or different than what most of us think about. The exceptional part about his thoughts is that they often overwhelm and paralyze him. In fact, I found his preference for short and agreeable sentences to be both surprisingly fresh and genuine, very much in line with the character we are presented with. My only problem with the first episode is precisely his ominous meeting with the so-called Mr. Robot (Christian Slater). It is only in these moments of exchange between the two that the show opts for speech and clarity instead of introspection and doubt. However, I do see the possibility of the show utilizing the dichotomy between Elliot and Mr. Robot to great effect, although exactly how it will do so remains to be seen, and it could easily become the thing that derails the show from its very astute and elegant premise. RATING: 4.5/5 — Extremely promising, addictive, suspenseful and very well written. Is it up to the standards set by Breaking Bad? The jury is still out! Note: This will be the first of ten posts that will attempt to review each episode of the first season of Mr. Robot in a new attempt to now include my extensive serial show watching activities of the last couple of years into this blog of mine. If you’d force me to pick only one I really be hard pressed to choose. 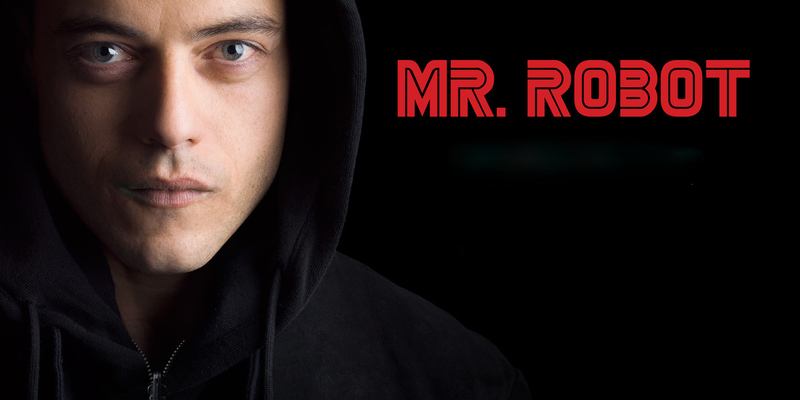 As I’ve just seen it I’d probably go for Mr.Robot as it is such an amazing show, but so was Breaking Bad. Hope you’ll enjoy it as much as I did. This is surprising and impressive. I wouldn’t have the courage today to put any show past Breaking Bad. I will reserve my judgment on whether I agree with you or not on which one is better than the other. We are still too early in the game, and Breaking Bad only got better as it progressed. Thanks for stopping by!